Kawasaki has built a machine that negates the frustration commonly associated with applying screen protectors to iPhones. Humans, fickle and emotional beings that we are, created machines in order to better accomplish some of the tasks that we find particularly difficult or monotonous. 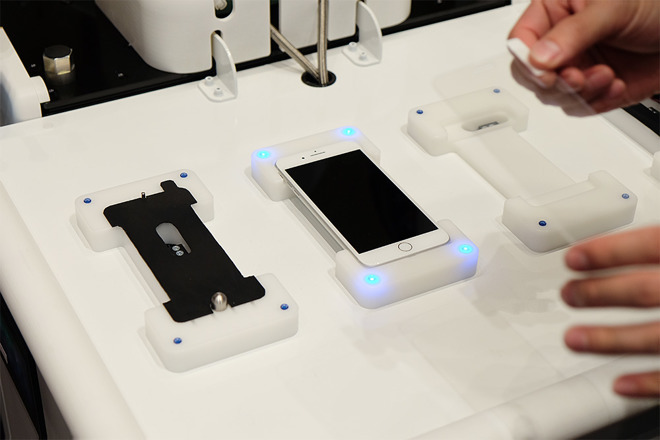 Such is the case with Kawasaki's new robot called duAro, which is able to perfectly apply screen protectors to iPhones — a job that often brings woe to anyone within a ten-meter radius — with a marked lack of tears and frustrated grunts. The robot's calm, calculated skill was put on display as part of this week's Pepper World event in Toyko. The machine itself actually interfaces through a Pepper unit, which itself can accept various tasks and pass it along to the duAro system. Aside from its two arms, which may or may not be nicknamed "Style" and "Grace," the duAro system has another attribute consumers might find appealing — Kawasaki has made it available to businesses as well as the public. There may come a day when the duAro is up and running in Apple stores or other mobile merchants, ready to work its mechanical magic in front of bewildered and relieved customers.